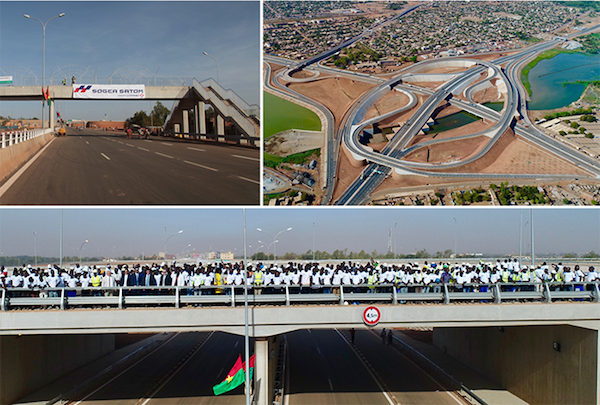 On November 15, 2018, the President of Burkina Faso, Roch Marc Christian Kaboré, inaugurated the new northern Ouagadougou interchange. The project was launched in December 2015 to relieve one of the most congested areas of the capital of Burkina Faso. This contract, worth € 102 million, was entrusted to Sogea Satom by the Ministry of Infrastructure. This project consisted of 14 engineering structures, several of which had deep foundations and two were located above a railway line in operation. The Sogea Satom teams worked on a very urbanized ground with a very dense traffic. It took them 35 months to complete this project.